Visiting families of policy beneficiaries in My Loc district, Minh expressed his gratitude for their contributions to the cause of national protection. He expected them to continue following the Party and State’s laws and policies as a role model for the proceeding generations. The delegation also attended a Tet (Lunar New Year) gathering and met workers at the Nam Duoc Ltd., Co., in Nam Dinh city’s Hoa Xa industrial park. At the meeting, the Deputy PM stated that the Party and State will continue to create favourable conditions for workers. 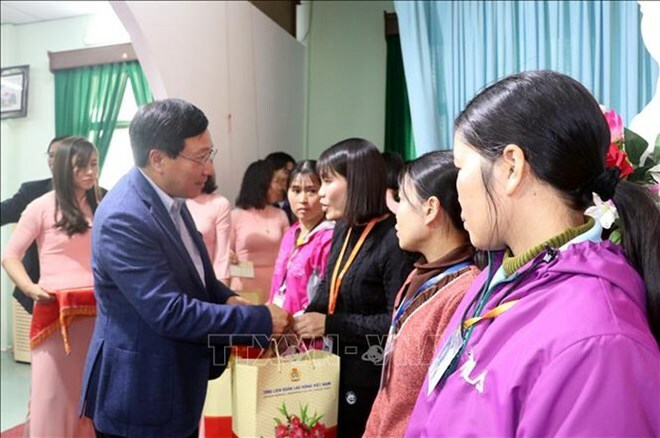 He asked Nam Dinh authorities to be more attentive to the living standards of local residents, particularly policy beneficiaries and poor families, adding that trade unions at all levels should work to take care of labourers’ needs, especially as Tet approaches. Minh requested that businesses create favorable working conditions for their employees, ensuring they receive the appropriate wages, bonuses, and social and health insurance in line with regulations. Workers, meanwhile, need to be creative and help companies increase their productivity, thus making contributions to the social-economic growth of the locality and the nation, he said. As part of their trip, the delegation presented nearly 200 gifts to local poor households, policy beneficiaries, Agent Orange/dioxin victims, and disadvantaged workers.